EMD Compliance Log – Welcome to the EMIT Technical Forum! The compliance datalog records all of the NESHAP related events as they occur into a single, comma-delimited, CSV file. The name of the file is “Compliance_<FACILITY>_<UNIT>.csv”, where <FACILITY> and <UNIT> are the values provided in the setup procedure. The last eight recordings can be viewed, and the complete log can be downloaded, from the Compliance Log screen (Pg. 131). This file logs pre cat temperature, catalyst pressure, maintenance activities, and other items. 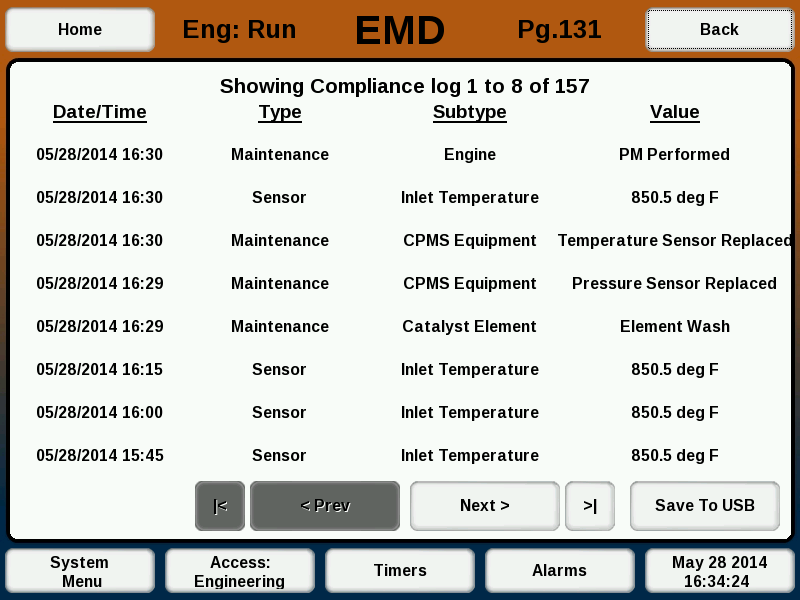 Reach the compliance log screen by selecting "EMD" on the EIM Home screen, followed by "Compliance Log". The datalog file will remain on the EIM and continue to be logged to after downloading.